Dubai: Abu Dhabi Commercial Bank (ADCB) shares, which witnessed consolidation post the merger announcement, rose to its highest in 13 years as traders resorted to renewed buying on expectations of synergy from the merger. There has been a buying frenzy in shares of ADCB and UNB since September 3, when the merger news was announced. ADCB shares have gained 32 per cent, while UNB has accumulated 48 per cent in value in the past five months. On Monday, ADCB closed 2 per cent higher at day’s high of Dh9.49, its highest level since 2006. Traded volume rose to 6 million shares, thrice the average volume of 2 million. “The bigger picture (for ADCB) is extremely bullish with company also proposed 46 fils dividend. Volumes also went up and traded almost 33 million shares in last three weeks signalling non-stop accumulation,” said Shiv Prakash, senior analyst with First Abu Dhabi Bank Securities in a note. The dividend yield for ADCB is pegged at 5 per cent based on the current price. First Abu Dhabi Bank (FAB) shares gained a strong momentum despite weak opening as renewed buying pushed the stock higher to consolidate near its highest level in five years. 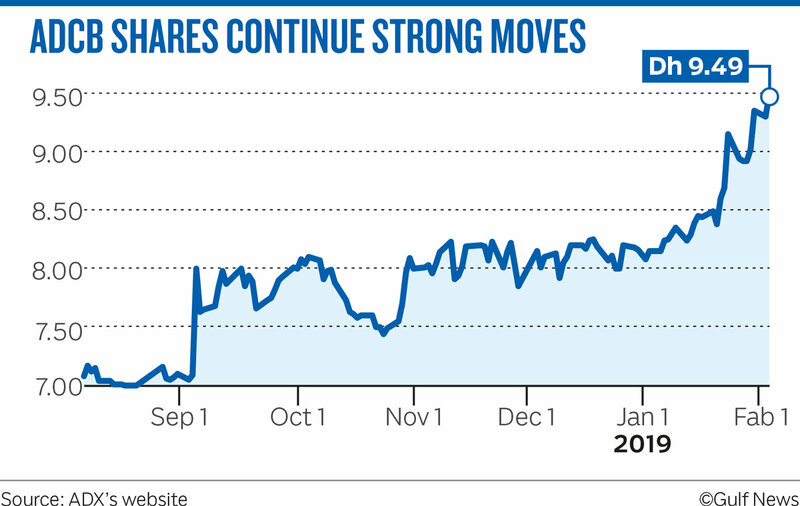 FAB shares rose as much as Dh15.40, before closing 2.27 per cent higher at Dh15.34. “First Abu Dhabi Bank’s decision to increase the foreign ownership limit found some interest and boosted the stock and the index to highs,” Issam Kassabieh, Senior Financial Analyst, Menacorp said. Union National Bank closed 0.96 per cent higher at Dh5.25. Boosted by bank shares, the Abu Dhabi Securities Exchange general index closed 1.03 per cent higher at 5,128.09. In other stocks, Etisalat closed 0.24 per cent Dh16.88. “I would start positioning more in Dubai’s ENBD because I’m expecting news on the foreign ownership cap to be spoken of soon and we know where that takes the stock. I would also keep an eye on CBD and the smaller Dubai banks,” Kassabieh said. Emirates NBD closed 0.52 per cent higher at Dh9.6. Elsewhere, Saudi Arabia’s Tadawul index was weighed by weakness in energy shares. The Tadawul index closed 0.07 per cent lower at 8,520.64. The energy index closed more than 1 per cent lower at 4,711.29. The Muscat MSM 30 index closed 0.46 per cent higher at 4,166.30. The Qatar exchange index closed 0.36 per cent higher at 10,727.53.